One of the promises which accompanied the Etihad Guest devaluation announcement was that more business class seats would be available on some routes. 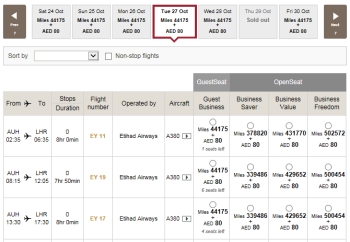 I have never – ever – seeb Etihad offer more than two seats in business class on any plane. It is my biggest problem with the programme. Whilst the screenshot is a little tricky to read, you need to trust me when I say that there are SIX A380 Business Class Suites available on one service. Another service has four seats. These extra seats only seem to have been added to selected periods. If you look at next Easter, for example, you are back to the usual ‘2 per plane’. If they are becoming more flexible, though, it would be a major benefit for families. The big car companies have been sniffing around the ‘car by the hour’ sector recently, seeing it as an ideal way to get potential future customers familiar with their vehicles. I have written about Zipcar (now owned by Avis) before. You can even earn Avios points now as a Zipcar member. We are members in London and, together with Uber and Gett / GetTaxi, they cover all of our driving needs for a fraction of the cost of running a car. Ford is now rolling out its own service, go!drive, following a trial last year. The cars used are Ford Focus Electric and Ford Fiesta models. One of the downsides of Zipcar is the £59.50 annual fee. 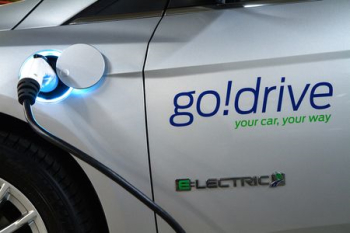 In order to encourage you to try go!drive, Ford is not charging an annual fee. It is also giving out £20 of free driving credit for signing up. At 17p per minute – which is more than Zipcar costs – that gets you almost two hours of driving. go!drive allows you to make a one-way trip as long as it ends at a go!drive location. Note that only automatic cars are available. The go!drive app is only available on iOS at the present time so Android owners cannot take part. The big downside compared to Zipcar is location. Because Zipcar has hundreds of locations, almost all on-street, there is usually one close to you in London. go!drive is currently only operating out of a handful of car parks which makes it less likely that you live within walking distance of one. The company is planning to have 20 sites up and running within a few months. Zipcar waives the membership fee if you threaten to leave. What I need is a car rental service like Boris bikes, having to return the car to its original location makes these services not very useful for me. Rob, do you know how long Etihad’s redemption tickets are valid fir? Is it the same as BA, in that you have to travel within 12 months of the booking date? That is an industry-wide standard because Amadeus and Sabre can only handle 12 months of ticket validity. The question is whether Etihad would be happy to issue you a new ticket with a new booking reference if you tried to rebook that far out, without charging the extra miles – I would be surprised if they allowed it. BA did not allow this in the devaluation. Drive now is similar, except you can park it in any legal space (inc meter or resident only spaces), which makes it much more useful. And it works on Android. Drive now excellent in North London. New cars, clean and very handy for A to B drives. Coverage is excellent in Berlin too. Another downside to the Ford trial is that it’s Crapple phone only!! No mention on their FAQs of Android or Windows. Please don’t start about the demographics of Crapple owners. I’ve seen the queue outside their West End temple to satan and it looked like a refugee line up. That’s because millionaires look like refugees these days. Well both the top and bottom ends are flooding into London, so who can tell. Except the manners from the lower end are usually better than the top end ones. The men do, the women less so in my (substantial) experience! I initiated my transfer to Etihad on Thursday night ( 4th June ) and they got credited today without bonus ! Give it 48 hours, the bonuses seem to be added separately. Just to advise, my missing 20,000 miles appeared on my MBNA Etihad statement today which is good news. Should sweep across in the next few days. My MR bonus took about 4 days to post after the initial MR points arrived.